Mvvm is primarily built around ViewModels and Views. 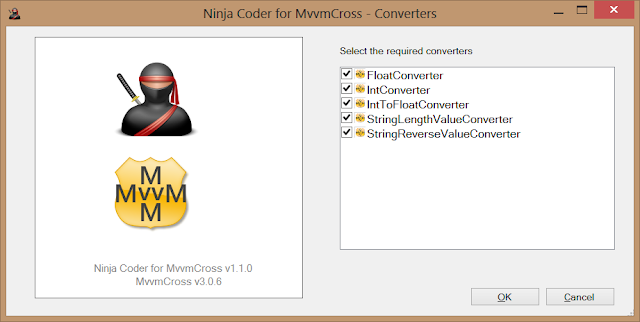 With MvvmCross you have a view for each UI plaform and a ViewModel that resides in the Core library. 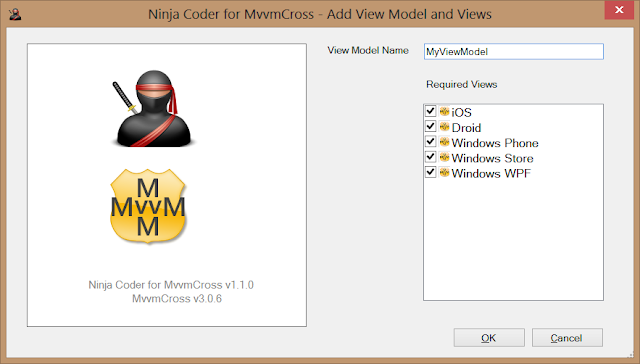 ViewModels and Views are not particularly hard to create manually - But Ninja Coder does make it slightly easier by creating Visual Studio item templates that implement base class for ViewModels and the UI Views and linking all views to the viewmodel. Below the 'Add View Models and Views' screen is shown. Again the View Model and View item templates can be used with out the Ninja Coder Addin. Converters are very much a work in progress (some people, myself included would say the whole project is a work in progress!). At the moment it will add a relevant converter file as shown in the screen shot below and add the file to the Converters folder in the Core project. Again the Converter item templates can be used with out the Ninja Coder Addin - can you sense a theme here? No WPF project was added to my solution, and I can't figure out how to get it to be added. The wizard said it would be there, but it's not. Is there a way to get WPF added?